A 2 day event to celebrate climbing, conservation and the passion of the Gunks community! 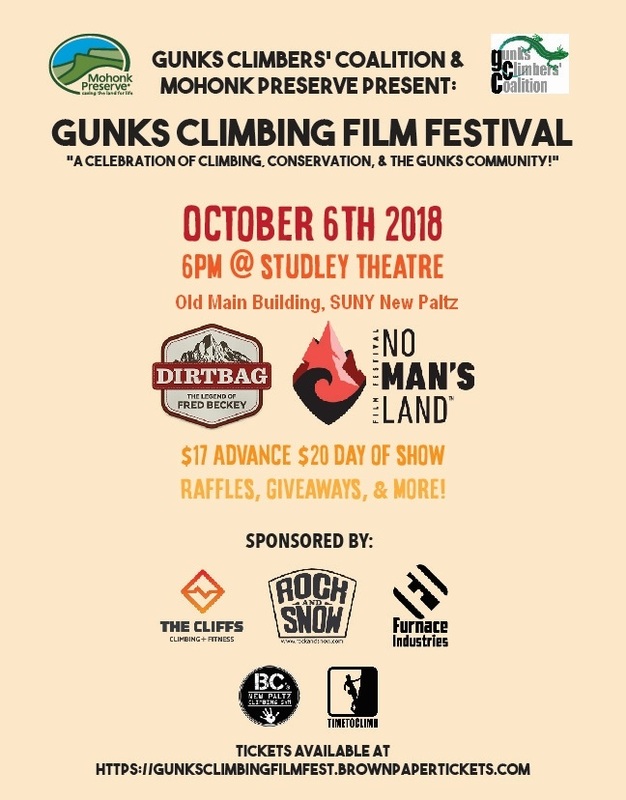 The Gunks Climbers’ Coalition is super excited to partner with the Mohonk Preserve for the newly renamed 2018 Gunks Climbing Film Festival! This will be the first time the GCC is putting together the Saturday evening program and we’re so grateful for the support of our sponsors that help make this possible. Come get together with your fellow rock warriors to hangout, chat and watch some of the best climbing films out this season! 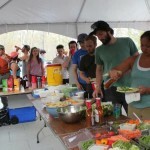 Festivities will begin with a free Climbers’ Reception at the Mohonk Preserve Visitor Center. The event will include a presentation by Mohonk Preserve Chief Ranger Andrew Bajardi on the highly skilled Preserve Ranger team. There will also be a raffle of Rock and Snow, and Preserve gear, and complimentary refreshments. The Film Festival will take place at the Studley Theatre at SUNY New Paltz. We will be premiering this year’s No Man’s Land Film Festival collection with shorts that are un-defining what it means to be a woman in Adventure, Sport & Film! Also being featured is the full-length film Dirtbag: The Legend of Fred Beckey. The American “dirtbag” mountaineer whose name is legend around climbing campfires. This rebel climber’s pioneering ascents and lifestyle form an iconic legacy that continues to inspire generations. Our incredible Title Sponsors – Rock and Snow, Furnace Industries, The Cliffs, Bacchus Restaurant, BC’s New Paltz Climbing Gym & Time to Climb, who have made this event possible this year will be donating gear & prizes into the raffle! So make sure to get your raffle tickets for a chance to win some awesome climbing gear and other prizes! 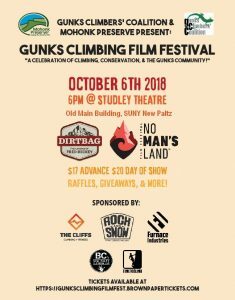 Prior to the screening, the Gunks Grunt Pull-up Contest sponsored by Furnace Industries will be held to test the mettle of attendees with prizes to top male and female winners. Immediately after the Films on Saturday Night there will be an after-party hosted at Bacchus Restaurant around the corner from the theater New Paltz!! Purchase tickets online by midnight Friday 10/5, or buy them at the following locations: Rock & Snow, The Cliffs at Valhalla, The Cliffs at LIC. The Old Main building on the SUNY New Paltz campus doesn’t really have an address, but it will come up in Google Maps under “Old Main SUNY New Paltz.” (Do not go to 1 Hawk Drive, that’s the other side of campus). You can also set your GPS to 46 Plattekill Avenue and you will find the building and the entrance to the Studley Theatre across the street from that house. If you don’t find street parking there, the best place to park is along Sojourner Way at the end of Mohonk Road on campus, which is lined with parking spaces. After parking, walk around the Old Main building to the opposite corner with the side entrance facing Plattekill Avenue. That’s the entrance to the Studley Theatre. 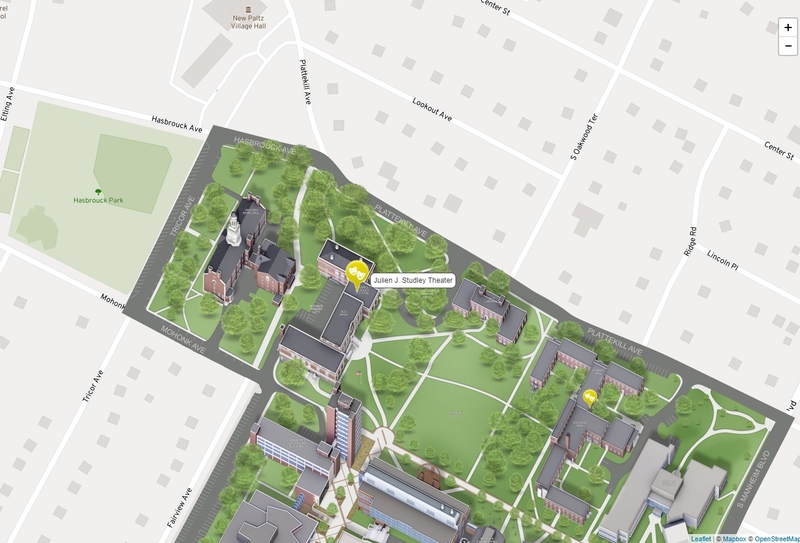 Click here to get full interactive map of the SUNY New Paltz campus. Interested in being a sponsor? 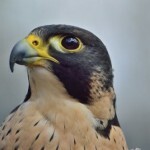 Please contact GCC Board Member Nick Hernandez at Nicholas@TimetoClimb.com. 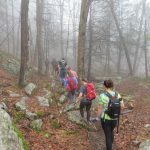 All proceeds from this event are to support the non-profit organizations, the Gunks Climbers’ Coalition and the Mohonk Preserve.